Minor shaping and trimming of stray shoots in order to maintain the tidy appearance of blue rug junipers can be done safely anytime throughout the year. But major pruning should be performed only in very early spring before the plant begins to set new buds for the season. Careless pruning can result in the creation of large, unsightly holes and gaps throughout the Juniperus horizontalis. These will never regenerate, so the plant will look awful forever. Avoid this with proper pruning, which allows you to reduce the size of the plant without ruining its naturally attractive appearance. 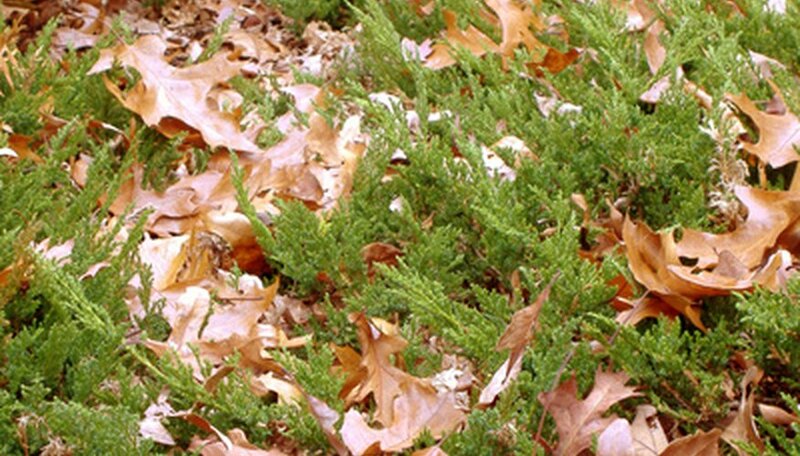 Prune out any dead, damaged or diseased limbs throughout the blue rug juniper using sharp shears. Remove stems all the way down to the point where they emerge from a larger branch. Make your cuts clean, leaving no stumps or ragged spots. Avoid removing any more old wood than necessary. Budding is produced only by new growth, so any older branches trimmed out won’t re-grow. Remove side stems that poke out noticeably or unattractively beyond the natural perimeter of the foliage. This will produce a more balanced appearance. Inspect the interior portion of the blue rug juniper, where a natural “dead zone” develops. Stems aren’t really dead, but new buds won’t grow due to lack of light and adequate air circulation in that area. Open the dead zone up by removing undesirable stems. This will allow for better air circulation and permit more light into the center of the plant. Look for spots where two or more branches cross over or rub against each other. Leave the nicest one there, and trim one or more of the others out. Remove excessively overcrowded growth. Choose carefully, because stems cut back into this area won’t re-grow. Trim out a few stems from the top if your blue rug juniper is excessively overgrown. Leave plenty of young foliage to promote healthy, new growth while covering the dead zone. This will keep the top of the plant looking attractively full while allowing light and air to reach its interior. Snip off very young shoots throughout the plant wherever you wish to promote branching.